Each month I pick a question sent in by one of my newsletter subscribers to answer. June’s Reader Question of the Month is from Naomi. Q: What is the best way to prevent burnout in general? And follow up question, if you think you are already feeling the effects, what can you do to prevent it from taking over your overall wellbeing completely? Let’s take a look at your lifestyle and see if you may be prone to experience periods of burnout. Are there activities you do repetitively that leave you mentally, physically, emotionally, relationally, or spiritually depleted? You have to recognize your risk and then be willing to change something. You can’t correct what out of balance in your life if you won’t confront the issue. You have to challenge your automatic responses and determine if they are serving you well. Have Common Burnout Solutions Failed You? I like looking at things from the perspective of what’s not working and answer the question WHY is it not working. There are some common burnout prevention tactics you probably have tried and found them lacking. Let’s tackle some of them and see why they didn’t work. Vacations– One of the most common recommendations for someone who’s feeling burned out is to go take a vacation. Most of our vacations are everything but restful! We spend our time away just as busy as we do at home, just doing different activities in a new location only to fall into bed exhausted every night. There is no time for healing, restoration, or recovery. A vacation with the ability to improve burnout does not have to be one spent sitting in solitude staring at the ocean, but it does need to help correct the lifestyle imbalances that drain you. Downsizing– Another common burnout relief tactic is to systematically remove things from your schedule. It seems reasonable that scaling back your responsibilities should improve your feeling of overwhelm. The problem is most of our most depleting responsibilities are things we can’t easily cut ourselves away from. Can someone say teens! 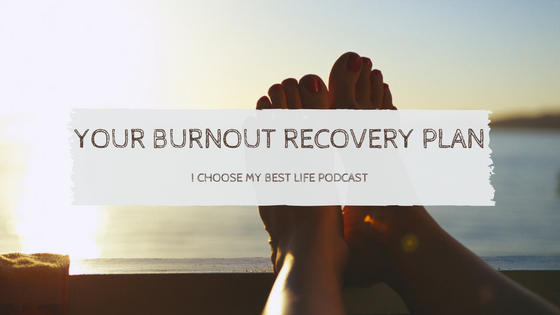 Surviving burnout has to be possible even in the midst of unnegotiable circumstances. Multi-tasking– Attempting to do many things at one time may seem like a way to get much done and free up some margin in your day, but multi-tasking often backfires and leads to burnout faster. It splits your attention between activities and increases the potential for errors and reduces your overall performance. You actually finish faster if you allocate time to complete each task before moving to the next. If you are wondering what you can do if you’re already feeling the effects of burnout, here’s a simple plan to help you recover your life, renew your energy, and restore your sanity. Identify the areas of your life you are most feeling the effects of burnout. Determine ways you can pour back into those areas. Develop work-rest ratio that allows you to be your most productive and still able to retain your joy and happiness. « Why Am I Tired All The Time?